Victory Is Life - Our Fourth Expansion, Coming June 2018! UPDATE: We're going to continue updating this post with the rest of the cast as they're announced! Up next, the return of a familiar face. J.G. Hertzler has spent the last year guiding players in Star Trek Online as the long-thought-dead Klingon general, Martok. Now he will lead the forces of the combined Federation, Klingon, and Romulan alliance into battle against the Klingons’ oldest and greatest enemy, the fearsome Hur’q. Adventure once again with the legendary Klingon general when Victory is Life releases in June 2018 on PC, and later this year on Xbox One and Playstation 4. Dr. Julian Bashir, as played by Alexander Siddig, is bringing his medical expertise to the world of Star Trek Online! The secretly augmented Doctor hasn't been seen on Deep Space Nine in many years, but the threat of the Hur'q and the return of Odo will draw him back, putting him in touch with some familiar faces and some old conflicts. Speaking of both friends and enemies, the plain, simple tailor named Garak is returning to world of Deep Space Nine, and Andrew Robinson is returning to play him. Garak was one of the most fascinating characters in all of Star Trek history, constantly walking the grey area of the Star Trek universe. We're so excited to see what he brings to Victory is Life. As revealed on our Ten Forward Weekly community stream on April 5th, Star Trek Online is incredibly happy to announce our next Star Trek actor to join Victory is Life: Aron Eisenberg! 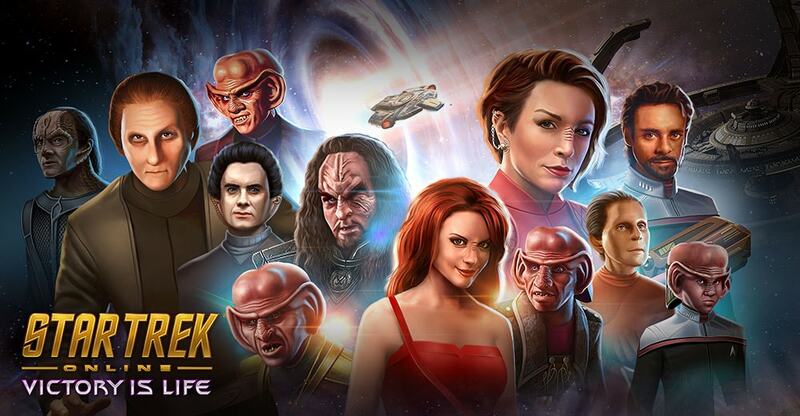 Aron is returning to the role of Nog, the first Ferengi to join Starfleet, and the Captain of the U.S.S. Chimera. Nog is a former Chief Engineer of the Enterprise, as well as a veteran of the Dominion and Iconian Wars. With the return of the Hu’rq, he’s been called into action and will once again be interacting with your Captain in a race to save the galaxy. Congratulations to all of our Captains who made it through our Star Trek Online hidden puzzles, and found their way to this news first! We’re incredibly happy to announce that Jeffrey Combs will be joining the cast of Victory is Life, as two of his most famous Star Trek characters, Weyoun and Brunt! Jeffrey Combs is one of only five people to play seven or more different characters in Star Trek, a distinction which includes fellow Victory is Life castmember J.G. Hertzler. In the Star Trek: Deep Space Nine episode, “The Abandoned,” Bumper Robinson played a young Jem’Hadar who was found on Deep Space Nine as a baby. He grew to near adulthood in a matter of days, and despite Odo’s attempts to reason with him, returned to Dominion space to be with his people. That same Jem’Hadar, Dukan’Rex, is now an Elder First, and will be a central character to the story of Victory is Life.